Super Hero Boy: I've got a secret to share! I've got a secret to share! Thanks to Team Mom I a new book publisher that I am really excited about. The Secret Mountain publishes absolutely stunningly gorgeous the books themselves include artwork inspired from around the world but that's not the best part... each book also includes a cd soundtrack located in the back of the book that is inspired by the book or inspired the book! Our favorite that we have seen thus far is A Duck in New York City! 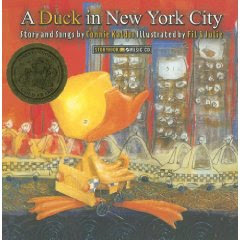 A Duck In New York City is about a duck who longs for city life and to do his little ducky dance on Broadway. The problem is he is a small duck with little wings so getting to New York City is quite the challenge for this little guy. He meets some people along the way who all believe in him only to be greeted by the Mayor when he finally arrives. A cute story with very urban inspired modern artwork it was as fun to look at as it was to read and don't even get me started about the included CD. I am really impressed as a whole with the musical selections that are included with each Secret Mountain book and honestly I can't tell you which I like more the books and their artwork or the cds. A Duck In New York City's soundtrack has a bit of a folk little bit Broadway sounding soundtrack cute, over the top, and absolutely fun to sing. 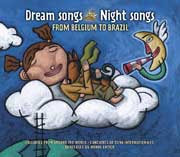 If your looking for a new bedtime book you would be really interested in Dream Songs, Night Songs. This book had my favorite artwork of all three very much Spanish inspired the folk looking paintings included are beautiful, I'd love to have a picture of the painted cow on my wall and the sailboat maiden with the baby in her tummy is stunning. The story itself follow some of the dreams from children around the world the story is told in both English as well as french and Spanish if your household is multi lingual. The included soundtrack is a beautiful collection of lullabies from around the world. I have a hard time picking a favorite song included but if I had to I'd have to say that the Brazilian song Acalanto is our favorite. Lastely the final book was a hard second of my favorite of the three Secret Mountain books was Down At The Sea of the books we reviewed. I have to say the soundtrack included is really amazing and my favorite of the three as you will find songs written by Billy Joel, Carole King, Neil Young... really an all star cast of writers I'm not sure how you can go wrong. 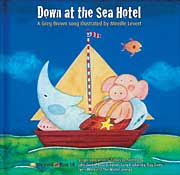 The story itself is adorable and is a bedtime story about the animals going to sleep at the Sea Hotel. Its a short story and very toddler friendly with cute illustrations and really the only reason it does not rank as my favorite of the three is the fact that the other two books had very unusual illustrations that really caught my eye. The song Barefoot Floors by Neil Young is wonderful, I am going to have to learn it to sing to Connor at bedtime as its really beautiful. They are all really great songs I can't say that any of them are boring. One small thing I should mention. All of The Secret Mountain books come with a cd which I mentioned that includes the sounds that come with the book, however they also come with a PDF version of the book that will allow you to take the book with you on a laptop if you wish or even print out any page of the book you wish. Its really an unusual aspect of the book as though PDF books are nothing new I've never actually seen a book that includes its PDF version with the publication. I transferred all three of our books to my laptop so we can take them with us to the grandparents house. If you have a electronic book reader you can also transfer over the pdfs as well! You really have to go check out The Secret Mountain to see their entire selection of books.